At Lamar High School in Houston, Texas, Brian Orakpo lettered three times at defensive end. He was a two-time first-team All-District choice and helped his team to a 29-8 mark during those three seasons. Brian was recruited to the University of Texas as a defensive end prospect. 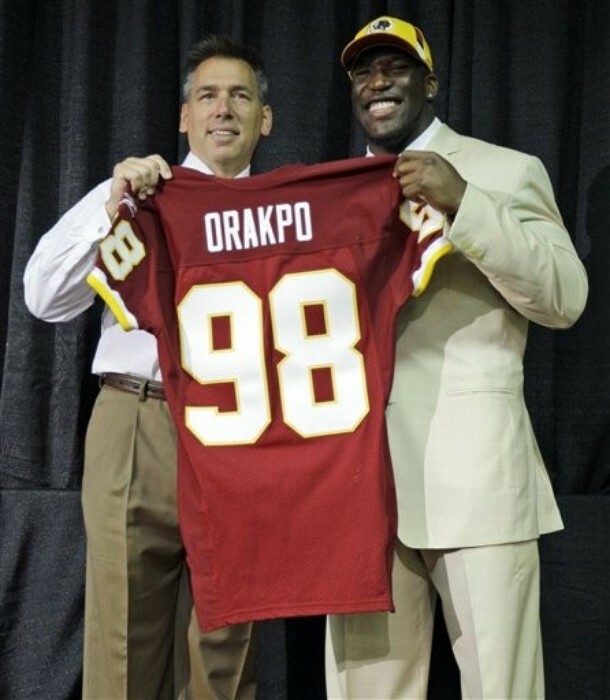 While at UT, Orakpo was named Defensive Freshman of the Year in 2005. As a senior, he won the Lombardi, Hendricks and Nagurski awards and made a case for himself as possibly the best senior defensive lineman in the 2009 draft. All of the accolades were won playing the defensive end position, from high school to college. In the trenches, coming off blocks, and taking off from the four-point stance seem to be the natural position for the rookie. So why is it now in the big leagues Brian Orakpo is being tapped to play strong-side linebacker? Rocky McIntosh, H.B. Blades and Chris Wilson are all experienced and capable of playing that linebacker position. The coaches must see something extremely versatile in Orakpo to move him into a fresh position. With the lackluster QB rush the Redskins showcased last year, one would think Orakpo’s defensive end position was set in stone. By the looks of early season workouts that might not be the case. But sooner or later the ‘Skins nation will be calling for Orakpo to be positioned in the exact spot where Jason Taylor (D’oh!) used to be. Let’s hope Brian Orakpo lines up right next to Albert Haynesworth for starters. After seeing what he is capable of from the DE position, Orakpo’s position shifting would be much more complimentary to the defense. Heck, if Orakpo wants to kick extra-points I’m all for it, as long as his first initiative is to come off the line, around the corner, and murder quarterbacks from the blindside.